Sammy Leathers presents a serving of roasted corn and a plate of "sopapilla relleño" at Tio's Garage & Taco Station on Ward Avenue. More than a decade ago, I read about nondescript restaurant spaces in New York where you might find generic Chinese food one year, only to come back a year later and find a new name and a new cuisine, like Italian or Mexican. The lease and ownership never changed hands, but constant competition coupled with diners' short attention spans were making it necessary to keep serving up something new. It's one of those ideas that just got stuck in my brain, and I wondered whether this would ever work in Hawaii. 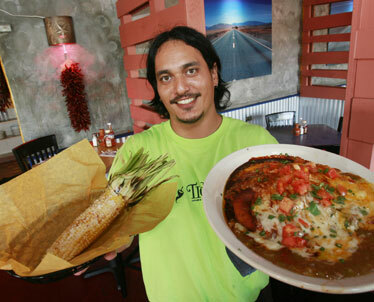 We're about to find out now that Ed Wary's Dixie Grill's Ward Avenue shop has morphed into Tio's Garage & Taco Station. After an 11-year run, he said, traffic was slowing and he was ready for something new, although at the beginning of this year, he wasn't quite sure what to try next. No matter what, he wasn't going to leave Dixie lovers high and dry. They can continue to find solace in the remaining Aiea location, while food lovers in general now have the opportunity to sample New Mex cuisine that's new to the islands. Seeing a name like Tio's, I'd assumed it would be home to Mexican cuisine, but having traveled through northern New Mexico -- one of my favorite areas -- I recognized long chile ristras and specialties straight from the Land of Enchantment, like a green chili stew ($7.50) and "carne adovado" ($11.50). Through synchronicity -- involving the purchase of Blue Agave and Cacao scent from his wife's favorite perfumer, Jo Malone, and a trip to Mexico, where he met Florance Jaramillo, proprietor of the Rancho de Chimayo Restaurante -- Wary said he was invited to New Mexico to learn the art of cooking with chilies with Jaramillo and her staff. It proved to be time well spent. Although Wary's track record suggests a populist approach to restaurants, this time out he strikes a nice balance between mass appeal and authenticity, which is impressive. You'll even find staffers out roasting fresh chilies on the lanai by day. IT'S NOT EASY for restaurateurs to introduce new concepts, but fortunately, there are enough dishes on the menu that will be recognizable to the inevitable slow learners who will insist on calling Tio's a Mexican restaurant. With New Mexico touching the Mexican border, ideas and ingredients can't help spilling over, so at Tio's you'll find burritos ($9.25 to $9.75), taquitos ($8.25) and plates of two soft tacos ($8.50) filled with shredded beef or chicken. Entrees also feature choices of Spanish or spinach-flecked rice, and pinto or black beans. I loved that the beans were still recognizable as beans, instead of being the gooey refried puddle typically served elsewhere. A handful of lunch-only selections include a grilled half-avocado filled with shrimp salad ($9) and chorizo and beef burgers ($8.50), both of which I still need to try. Those who love foods that are bad for the body could end up eating something that's actually fairly healthful, like that aforementioned green chili stew that's all mild green chilies simmered with large chunks of braised pork, potatoes, carrots and "posole," or corn. Those accustomed to heavily salted, starch-addled stews might find this one plain, while others who understand what real food tastes like will rank this mellow dish high on their list of comfort foods once the temperature starts dropping this fall. Spinach and artichoke enchiladas ($14) left something to be desired. I was expecting to see whole artichoke hearts, only to find a mash of spinach, artichoke and diced onions. The flavor was fine, but without the heft and crunch of the artichoke hearts, the squishy content of the enchiladas pretty much blended in with the soft tortilla wrap. Before you even get to this point, you'll be plied with the requisite tortilla chips and excellent salsa. Don't settle for salsa alone when you can also order guacamole to accompany those chips. Few places make guacamole as fresh and vibrant as this. For $6.75 it's made in your choice of three styles: with lime, cilantro and diced onion; diced hot pepper and tomato; or charred corn, cilantro and lemon. If it's meat you want, the carne adovado is pork marinated in a spicy red chili sauce, baked until it's fall-apart tender. The ultimate in decadence is carne asada ($15), a 10-ounce slab of New York steak topped with green chili sauce and melted cheddar cheese. This one's bound to make any man happy. Speaking of happy, Tio's offers a whole roster of margaritas made with such uniquely Southwestern imports as sweet agave nectar and prickly pear cactus. There's an "acai" margarita as well. Served in mugs with straws and without salt, they're like slushes that pack an adult kick. One of these could sub for dessert if you're too full for a dense flan ($6), "sopapillas" (fried pastry topped with cinnamon sugar and honey, $3.75 for two) or coconut rice pudding ($7.50).